“Tito was great with me. I don’t think with any other manager I could have had that comfort level,” Jon Lester said on manager Terry Francona, who guarded the pitcher’s privacy during his treatment for large-cell lymphoma. Second of three excerpts from former Red Sox manager Terry Francona’s memoir, co-authored by Globe columnist Dan Shaughnessy, which went on sale Jan. 22. Jon Lester, who’d been called to the big leagues on June 10, 2006, was involved in a minor car accident on Storrow Drive the morning of the big day-night doubleheader at Fenway with the Yankees. Lester shook off his back pain and started the nightcap. He gave up seven runs on eight hits and was pulled with one out in the fourth. The Yankees beat the Red Sox, 14–11. Lester could barely walk when he woke up the next morning. That car going under my truck must have messed me up, Lester thought to himself as he struggled to get to the ballpark. It turned out to be something far more serious. The Red Sox were swept in the five game series at home (“Boston Massacre II”), then went to the west coast for a nine-game trip. Dustin Pedroia was called up from Pawtucket and made his big league debut when the Sox lost a sixth straight game in Anaheim. By the time Lester got the ball in Anaheim for the second game of the series, the Sox had disappeared from contention in the American League East. Lester snapped the losing streak to improve his rookie record to 7-2, but he still wasn’t feeling right. He had night sweats, was losing weight, and couldn’t shake a cold. When the ball club flew north to Seattle, Lester’s parents sent him to see his uncle Paul, an internist in greater Seattle. Lester reported to Terry Francona when he got to the clubhouse. John Henry arranged to have Lester, his parents, and uncle fly back to Boston on Henry’s private jet. “We all have our complaints about the workplace, but in the tough times they’d move the earth,” said the manager. Before taking their only child across the country for a battery of tests at Massachusetts General Hospital, John and Katie Lester met with Francona at Safeco Field. “We will take care of your son,” promised the manager. While Lester was at Mass. General, things got worse for Francona and the Red Sox. They lost their final six games of the trip, three in Seattle, three in Oakland. Manny Ramirez toyed with his bosses daily, changing his injury from a hamstring to a sore knee. The Sox sent Ramirez for an MRI in southern Calif­ornia and announced there was no structural damage. Manny’s malady was reframed as patellar tendinitis. Meanwhile, Lester and his doctor-uncle were calling the manager to explain the fear and ambiguity of his status at Mass. General. Francona was spitting blood into a towel when he met with reporters after the finale in Seattle. He had to restrain himself from snapping when radio reporter Jonny Miller accidently banged his cane into the manager’s knee. The Sox offense had been smothered again, and Francona spit out some truth when the inevitable Manny question was asked. 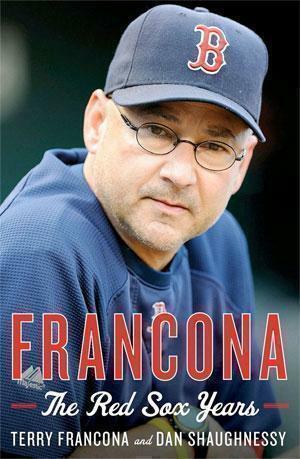 “Francona: The Red Sox Years” is now on sale. The manager’s bloodletting was due to him biting his tongue while on blood thinners. He was supposed to keep his INR blood level between 2.5 and 3, but it spiked to 5.1 during the road trip. A perfect metaphor for the trip, and the season. The white flag went up Aug. 31 when Theo Epstein traded David Wells to San Diego for catcher George Kottaras. The message was clear. There was still a month to play in the 2006 season, but the Sox were already thinking about the future. The Wells deal indicated it was all about 2007. The day after the Wells trade, the Sox announced that Lester had been diagnosed with large-cell lymphoma, an aggressive non-Hodgkin’s disease. The Red Sox connection to cancer cure is well documented. In 1953, after the Boston Braves left the Hub for Milwaukee, the Jimmy Fund became the official charity of the Red Sox. Ted Williams befriended Dr. Sidney Farber, the godfather of modern chemotherapy. With the help of the Red Sox, the Jimmy Fund has saved thousands of lives. For more than a half-century, Red Sox players have visited cancer patients at Children’s Hospital and the Jimmy Fund Clinic. An annual Red Sox flagship telethon raises tens of millions of dollars. Sox pitcher Bob Stanley was a champion of the Jimmy Fund, then benefited from the clinic’s research when his own son, Kyle, was successfully treated for a malignant sinus tumor. Mike Andrews, second baseman with the 1967 Red Sox, was chairman of the Jimmy Fund for more than three decades after he retired from baseball. In the days and weeks after the disclosure of Lester’s cancer, Francona protected Lester’s privacy furiously, admonishing any reporter who attempted to reach Lester’s family. The manager guarded the pitcher and his family as he would have protected his own family. 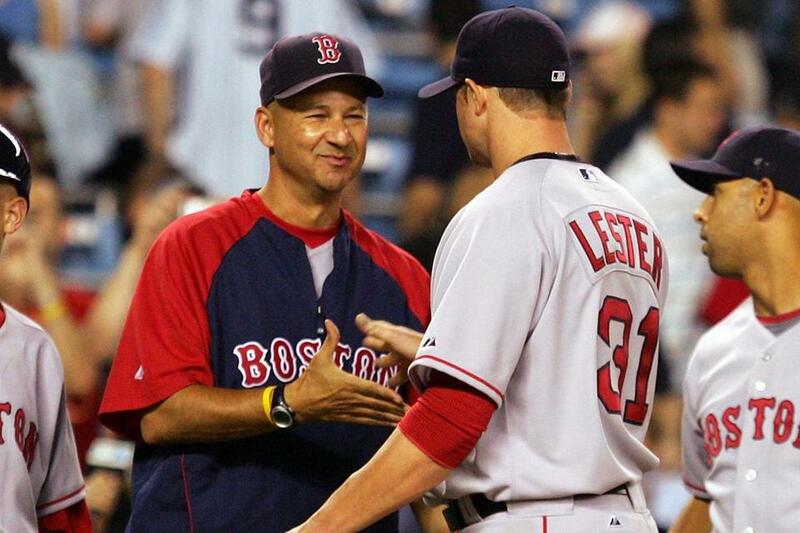 Before starting treatment in September, Lester visited Francona at Fenway. Then, after a single treatment at Mass. General, Lester went home and was treated at the Fred Hutchinson Cancer Research Center in Seattle. The manager and the cancer-stricken pitcher cut a deal. Francona didn’t need a lot of information or detail, but he wanted to hear from Lester after every treatment. The text messages would come every three weeks. That’s the way it went until the first week of December 2006. Francona was at the winter meetings with Epstein in Lake Buena Vista, Fla., when his phone rang. Jon Lester calling. No text. The manager was alarmed. Something might be wrong. He picked up and heard the voice of Lester on the other end. Ending the call, Francona put down the phone and started crying. He’d been holding on to his emotions for months. He hadn’t talked to anybody about it. Then, and now, Lester made it a habit to talk about Francona as a paternal presence in his professional life. The lefty was fond of saying his manager had been like a second father to him. Francona started the ’07 spring with Lester just as he had in 2005 — telling the lefty that he needed to relax. Don’t be in a rush. Work your way back. For his spring training debut, the manager sent Lester to Hammond Stadium in Fort Myers to pitch an inning of a “B” game against Twins minor leaguers. It was a baby step. Lester threw eight pitches in a one-two-three inning, which is exactly what the Sox wanted. Lester was still 10 pounds underweight and far from baseball-ready. He was not part of the plan for the start of the season, but the manager knew the lefty was eager to get back to the majors. Francona called Lester’s dad. Francona called Lester into his office. Seven months later, with the Red Sox leading the Colorado Rockies, three games to zero, Jon Lester started the fourth game of the World Series at Coors Field in Denver. Coming back from lymphoma, Lester had 18 starts in the minors, pitching in Greenville, Portland, and Pawtucket. He pitched only three games for manager Gabe Kapler at Greenville, but he met his future wife while pitching for the A-ball affiliate (“Everything happens for a reason,” said Lester). He returned to the majors July 23, pitching six innings in a 6–2 win, but experienced elbow trouble and went back to the minors for a start at Portland in late August. By October, he was strong. He was not on the Sox roster for the ALDS and was used only in relief in the Championship Series against the Indians. In the final game of the World Series, Lester smothered the Rockies for five innings while the Sox scored twice off Aaron Cook. When Lester walked Garrett Atkins on a 3-2 pitch with two outs and nobody aboard in the sixth, Francona walked out of the third-base dugout to pull his 23-year-old starter. Manny Delcarmen was ready in the bullpen. The manager found himself resisting the urge to hug Lester, right there on the mound with the whole world watching. Typically, Lester said nothing. He put his head down and shuffled off toward the dugout. Excerpted from “FRANCONA: The Red Sox Years” by Terry Francona and Dan Shaughnessy. Copyright 2013 by Terry Francona. Used by permission of Houghton Mifflin Harcourt. All rights reserved.